The Kavachi Volcano Sharks - We Love Sharks! The Kavachi Volcano Sharks - We Love Sharks! A team of ocean researchers are surprised to find a group of volcano sharks living in and around the Kavachi volcano. If you still think sharks are just like any other sea animal, you may have to think again. The volcano sharks are a small group of different species of sharks living, and thriving in a hostile environment. The extremely hot and acidic waters surrounding the Kavachi: a highly active submarine volcano. In fact, they even live right inside the caldera of the volcano. Read on to learn what we know so far. Kavachi is located close to the Solomon Islands. 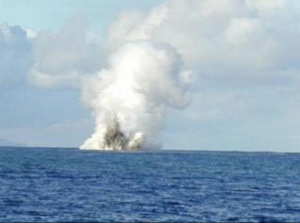 It is ranked among the most active submarine volcanoes found in the south-west Pacific Ocean. It erupted last in 2014 though no one can actually say how many other smaller explosions may be taking place underwater. There are occasional rumbles from beneath the water’s surface. These rumbles can be felt and heard and the resulting vibrations extend up to 10 miles away when there’s an actual eruption. A group of ocean explorers journeyed close to the volcano on an expedition partly funded by the National Geographic Society. Their objective was to create a map of the volcano’s peak and learn everything possible about the chemical plumes, geology, and general biology of the volcano. As you can imagine, this is a highly dangerous and extreme environment. Obviously, the water inside and surrounding the volcano is hot and dangerously acidic for human divers. Even when the crater isn’t shooting steam, ash, and lava up to the ocean’s surface, divers that have dared to reach the outer edge of the volcano in the past have had to turn back because of the high temperatures and the acidic burns on their skin. This time, Phillips Brennan an oceanographer and his team, used disposable robots, deepsea cameras, and National Geographic’s deep-sea Drop Cam to explore deeper into the site for the first time. Using the technology at their disposal, the team was able to stay at a safe distance and deploy the cameras into the volcano and even right down to the bottom of the volcano. A number of surprises awaited them. At first, the scientists were excited to see a stingray swimming gracefully in the footage right inside the volcano’s ash plumes. But, they were pleasantly surprised to see multiple hammerheads and silky sharks popping up in their numbers. Later, while they were studying more camera footage, they noticed something strange, large, brown and ‘blob-like’ on one of camera thumbnails. It was later identified as a large Pacific sleeper shark and this discovery really startled the explorers. This is a rarely seen shark that is native to the Pacific and Atlantic Oceans, as well as parts of Antarctica and Tasmania. It was found right at the bottom of the volcano. Pacific sleeper sharks can grow up to 7 meters (23 feet) long. They swim noiselessly for their size and with little body movement, all adding to their hunting prowess. “We were freaking out” said Phillips Brennan. Check out the National Geographic video below. You’ll see some of the sharks and other sea creatures that were caught on camera in this volcanic environment. 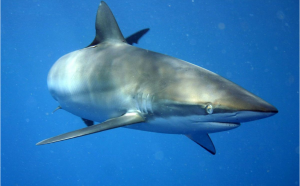 What Can We Learn About Sharks From This Discovery? Of course, a particular question kept bothering this team of researchers: How do these sharks survive? Though Kavachi was not erupting at the time of the expedition, other video footage from this mission showed carbon dioxide and methane gas bubbling from the seafloor vents. The surrounding water also appears in different colors due to the presence of different dissolved metals and sulfur. As a result, one can only wonder the kind of extreme environment these animals have had to adapt to over the millions of years of their existence. Are there other animals that can withstand such conditions? Do these sharks get an early warning to leave the caldera before an eruption? Or, are they unaware of impending danger and as a result they perish in steam and lava? Certainly, sharks are truly tenacious creatures and they go where so many other animals would not dare to. Even humans with all our technology cannot physically enter such environments without serious risks. This group of researchers are keen on carrying out more studies on these sharks vs the volcano. And as Phillips Brennan said, the mission went there with one question and returned with many. Until these questions are answered, you can bet the Kavachi volcano sharks will continue to remain a source of wonderment to us all. The Rise Of The Two-Headed Sharks: What Could Be Causing This Anomaly?